As the deadline for Canadian citizens and permanent residents to file their 2014 personal income tax return looms, it is very important that you know how to do your taxes properly. Also, you’d certainly want to make sure that you can take advantage of every credit and deduction available to you. To help you navigate the Canadian tax system, here are some of the most commonly overlooked tax credits and deductions you should be aware of. With CATC, parents can claim up to $500 per child for fees paid in 2014 for artistic, cultural, recreational, or developmental activities or programs. However, this tax credit often brings confusion to many tax filers. When parents hear “children’s arts credit,” most of them immediately think of painting or drawing. And if their kids don’t paint or draw, they automatically think that they won’t qualify for CATC. What they don’t realise is that the credit covers a wide range of activities. “The children’s art credit — that’s one that I find people don’t know what’s under there – they think, ‘well my child doesn’t do painting,’ but things like Girl Guides would count for that,” said Caroline Battista, senior tax analyst at H&R Block Canada. If you have incurred certain medical expenses, you can claim tax credits when you file your income tax return. For example, Ms Battista said you could claim some home renovations if you are caring for someone in your home who has a disability. You can also get deductions after getting travel medical insurance. Even if they aren’t making an income, students turning 19 before April 1, 2016 should file a tax return so they can take advantage of the GST/HST credit. Beyond the tax credits granted for tuition fees, they can get credit for textbooks and transit passes. Believe it or not, you can also claim many employment expenses as tax credits. Some good examples of employment expenses are professional or union dues, in-home office expenses, exams for professional certification, health care premium paid by you and not your employer, and tool expenses for trades people. Meanwhile, Laurie Campbell, CEO of Credit Canada Debt Solutions, is advising everyone to gather all their tax slips, receipts, and documentation before doing their taxes. 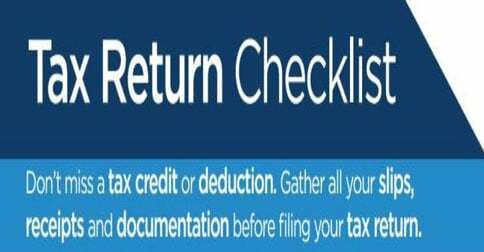 This will help tax filers like you to identify the expenses that you can claim as credits or deductions when you file your tax return.